How does it happen? The winter season begins with a round of early snow and we get all excited. Then it rains. Then it gets amazingly cold. Then we get teased again with some nice new snow but the winds blow it all away and then it snows some more and we start all over again. We are back in that "excited about winter" phase. After skiing the Sherburne, Gulf of Slides and Mt. 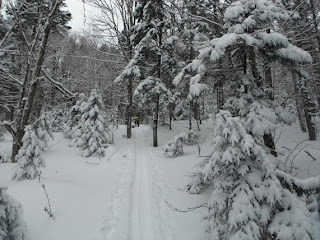 Willard as well as snowshoeing a bit further north on the Kelton Trail, Randolph Path and Howker Ridge, (all in this most recent week), I'm pleasantly surprised with the quality and quantity of the snow in the woods. What I'm less pleasantly surprised by is the lack of trails etiquette I'm seeing out there and without dwelling on this incendiary topic, I'd like to remind people not to posthole (!) 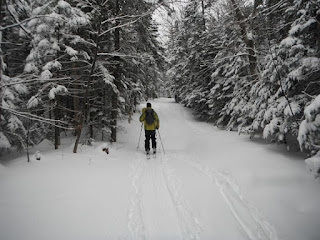 and please, when skinning up a ski trail stay to the sides and in single file. I came across a group skinning four abreast on a narrow section of trail and if not for my superior skills -- a skier is always in control, after all -- it would've resembled the mayhem at the end of the bowling alley on the PBA tour. I'll end this segment by deputizing you all and suggesting that all measures, no matter how extreme, be utilized in disciplining these egregious offenses. (of course here's the disclaimer: I don't really mean this.) Please politely educate offenders because I think they just don't know. Pity them and educate them. Looking ahead, the Mount Washington Observatory is calling for the possibility of more snow this week and mild temperatures making for a continuation of good back country ski and snowshoeing. Our length of day has passed the 11 hour mark which does not mean you can leave that headlamp behind but makes for some beautiful daylight hours to enjoy and with milder temperatures it won't be long before bare and very pale legs start to appear on the trails. Please remember that snowshoes are still suggested, microspikes are not crampons and there is still lots of fun to be had in the White Mountains. The following links might prove helpful: <www.outdoors.org> for reservations and trail conditions,<www.mountwashington.org> for weather and current summit conditions, <www.mountwashingtonavalanchecenter.org> for Tuckerman and Huntington Avalanche, climbing and skiing conditions updates.